Guests at Wilderness Safaris Chitabe Camp were delighted last week to witness an interesting standoff between a leopard and a porcupine whilst on morning game drive. 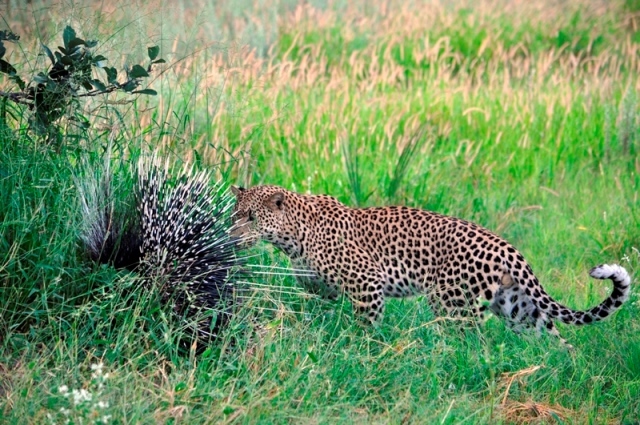 The young leopard was encountered playing a cat and mouse game with the porcupine. Well aware of the dangerous game she was playing, she toyed with the porcupine, somewhat carefully and attentively, for over an hour. The porcupine resisted her antics and survived the encounter as he kept his head tucked in at all times and his quills exposed and ready for defence. Chitabe and Chitabe Lediba Camps are situated in a private concession area on an island in the south-east of the Okavango Delta. Playing host to a range of habitats, the area is famed for its incredible numbers and diversity of wildlife, in particular predators. Other incredible sightings this month included a leopardess with two young cubs, lioness with four cubs, a clan of 20 hyaenas, range of elephant sightings, general game and more. Click here to read more. Guests at Wilderness Safaris DumaTau, Vumbura Plains and Kalahari Plains camps were also lucky to experience a range of Big Cat sightings this month, from a sighting of two new male lions spotted with a buffalo kill to the ‘Owens Boys’ in the Central Kalahari contesting for dominance.